Action from the Cookstown 100 road races, where Michael Dunlop and Dan Kneen achieved notable victories on the Orritor circuit. Dunlop rode through the pain barrier to win the Supersport and Supertwin classes, while Kneen won the feature event of the day on his debut. 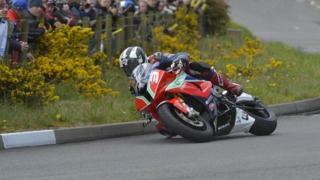 Manxman Kneen edged out Tyco Suzuki rider William Dunlop on corrected time to secure victory. Highlights of the Cookstown 100 will be aired on Tuesday 13 May at 23:05 BST on BBC One NI.